Boarded at a premier pet store in California. Perfectly feathered there. Enjoyed by all. Sold to a new home. Brought back to the store 2 months later, completely plucked. No medical reason for plucking yet she has never stopped. 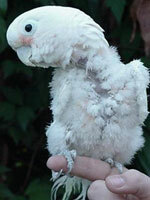 She has grown in much fuller down feathers now that she lives around other cockatoos. 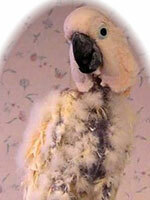 Age 5 in 2002, she arrived here featherless, wounded and utterly afraid of being left alone. Having been raised on a human instead of in a cage w/ toys, proper nutrition and taught to be self-sufficient, Buddah had no idea what to do when she suddenly found herself stuck in a cage. She was alone, no toys, no human. Her humans had become homeless. They lived in a van. She was rescued by a good Samaritan and brought here to Mollywood in the fall of 2002. Magoo was one angry bird 5 years ago. He is a cross between and umbrella and a moluccan. He's had 8 homes in 4 years. 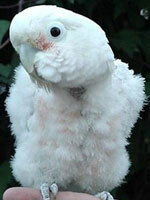 (The average parrot has 7 homes in a lifetime that can rival our own longevity.) Because of all his instability in his early years, he was a vicious, unpredictable biter when he first arrived. Today after a lot of patience and love, he has learned he is part of a flock who love him. His security has been restored and his trust in us grows daily. 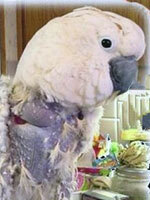 Missy was once forced to live in a small cage with an Amazon parrot who attacked her almost daily. Fortunately we were able to convince the owner she would do “better” with her own kind. Missy continues to battle with her own feathers but she has literally blossomed into one of the best “goofies” we have ever known! Popo came to us from another rescue group in the Midwest. We were told he was a vicious biter upon being returned to his cage and that he also was aggressive to small birds. We were never told what a mush pot lover bird he is. All he needed was a flock to feel secure. He loves humans and his flock very much and is so happy to be at Mollywood, his final home. Rico has a “prolapse problem”. After explaining in details the vet work needed, the owner took him to Dr. Onorati. We received email that night saying they’d left $100 toward his bill and please give him a good home. They were done. Mollywood has invested ten times that much in Rico's vet bills. He’s a FABULOUS bird and healthy now too! Sarah was purchased originally as a decoration for a Bed & Breakfast. Upon learning how messy and loud she was, she was relegated to the dark basement. Alone and afraid, she began to destroy feathers. When she ran out of feathers, she chewed off her own toe. The vet who did repair work on toe did not bandage it correctly, leaving her with a frozen ankle joint and limited mobility forever. Fortunately an employee found and rescued her and later found us. Sarah lives happier now that she is loved and cared for. 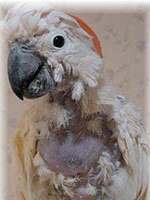 Simba and her friend, Pearl, arrived on 12/1/02 in the 22” square cage they shared. Both were plucked but Simba had a gaping wound in the middle of her chest. After a thorough exam and xrays, it was determined that Simba’s keel bone was shattered quite badly. The vet suggested the damage was probably due to a collision with a hard flat surface such as a wall or floor. Today after a few surgeries and over $3,000 in vet bills, she is much better. She still plucks and sometimes digs too deep but she has blossomed into a wonderful, happy, healthy bird.